In July 2017, Robert O. Young, who has marketed himself as "Robert O. Young, M.S., D.Sc., Ph.D.,"was sentenced to prison for practicing medicine without a license. Young would like you to believe that he is a highly educated and distinguished scientist. I do not believe that is an accurate description. This article describes his background and the activities that led to his conviction. Before Dr. Young began his extensive nutritional research, his love for sports and science led him to the University of Utah—where he studied biology and business in the early 70's. . . . His education was temporarily interrupted by an ecclesiastical mission for The Church of Jesus Christ of Latter-day Saints. He successfully served for two years in London, England. In the 80's, following his mission and schooling at the University of Utah, Dr. Young studied medical microbiology—training under Dr. Robert Bradford at the Bradford Research Institute in Chula Vista, California. Dr. Bradford is now a trustee and professor at Capital University in Washington, DC, where he teaches live and dry blood microscopy. Dr. Young also studied darkfield microscopy. . . .
Young's books include: Back to the House of Health: Rejuvenating Recipes to Alkalize and Energize for Life (2000); Sick and Tired? : Reclaim Your Inner Terrain (2000); Back to the House of Health: Rejuvenating Recipes to Alkalize and Energize for Life! (2000); The pH Miracle for Diabetes: The Revolutionary Diet Plan for Type 1 and Type 2 Diabetics (2005); The pH Miracle for Weight Loss: Balance Your Body Chemistry, Achieve Your Ideal Weight (2006); and The pH Miracle: Balance Your Diet, Reclaim Your Health (2008). None of these books has any scientific standing. A recent article stated that Young took only one undergraduate course in biology and did not graduate from the University of Utah . The rest of his "training" is smoke and mirrors. Robert Bradford, who was convicted of laetrile smuggling in the 1970s, was not even a college graduate. His alleged "doctoral degrees"—two of them—were acquired from credential mills. For nearly 30 years, he operated a network of enterprises that included a Mexican clinic that offered quack treatments, a company that marketed dubious drugs and dietary supplements, a "research institute" that did no significant research, and a nonaccredited "medical school" that operated for about five years . In 2011, Bradford, his wife, and their company (American Biologics, doing business as C.R.B., Inc) were convicted of conspiring to violate federal food and drug laws and defraud individuals seeking medical care. The indictment stated that he marketed bogus Lyme disease products and a microscope system that was falsely claimed to diagnose the disease . Clayton College of Natural Health was a nonaccredited correspondence school that advocated unscientific and quack methods . Its requirements for graduation were minuscule compared to those for accredited colleges and universities that train health professionals. It closed in 2010 after Alabama began requiring accreditation for license renewal. Moreover, no correspondence school can prepare students to give competent health advice to clients because that requires years of clinical experience under expert supervision. Young's connections with Clayton and Bradford reflect extremely poor judgment. Claims that Robert Young is a distinguished researcher are preposterous. The National Library of Medicine's database contains no articles authored by "Young RO" that were published in a recognized scientific journal. His foundation's 2011 tax return contain an expense item of $3,915 for "food for research subjects," but the returns from 2003 to 2010 contain nothing that appear related to human clinical research activity and the 2012 return has no financial data. The Youngs supplements . . . literally bring new energy to each cell directly. It's a big idea that begins with the tiniest of particles—the particles called colloids. Since colloids are so small, it is easy for our cells to absorb vitamins and minerals introduced at this size. Knowing this, the pH Miracle begins by breaking basic nutrient elements into billions of colloidal particles. Then, unlike any other supplement provider, we ensure these colloids remain individually separated through a proprietary process called Micro-Ionization™. Perhaps the most striking difference about the Young's products are their living energy. Not only are colloids separated for prime absorption, they are given an additional electrical charge. This charge actually attracts the colloids to your cells where they can be instantly utilized. The energy within each cell literally "jumps." Functionality is rejuvenated. And your cells—and you yourself—can feel that maybe the energy you knew as a kid isn't so long gone after all . This description uses scientific terms, but the processes he describes are fanciful. In 2010, Young's "private retreats" were said to include "personal live and dried blood microscopy, preceded by an in-depth health history including developing an understanding of the physical, social, psychological, medical, and pharmaceutical components of a person's life." Young promises to "personally oversee each activity for the day which may include: history, microscopy, supplements, water and ionization, exercise, lymphatic massage, cooking, food preparation, colonics and other health programs." His findings would then provided in a 35-page blood microscopy report plus a recommended program and a three-month supply of supplements and other products he created. There were also group retreats that cost from $400 to $15,000, depending on the length and setting. In 2013, the private retreats cost from $1,295 to $2,495 per night. Not quite. Live blood cell analysis is carried out by placing a drop of blood from the patient's fingertip on a microscope slide under a glass cover slip to keep it from drying out. The slide is then viewed at high magnification with a dark-field microscope that forwards the image to a television monitor. Both practitioner and patient can then see the blood cells, which appear as dark bodies outlined in white. The practitioner may take Polaroid photographs of the television picture or may videotape the procedure for himself and/or the patient. The results are then used as a basis for prescribing supplements. Dried blood cell analysis is similar but is done after the blood dries. Although much can be learned by looking at blood cells under a microscope, the practitioners who do these tests draw conclusions that have no scientific validity are are used primarily to sell products . It would be interesting to know the context in which Young performed 15,000 blood analyses. In most states, doing blood tests and recommending products based on these tests are considered diagnosing and prescribing and are restricted to licensed health professionals. As far as I can tell, Young has never been eligible for any type of health-related professional license. 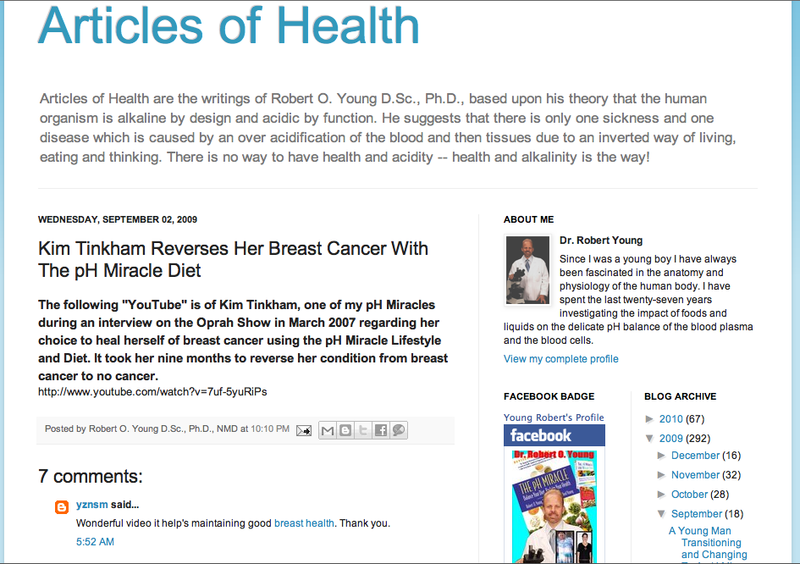 In 2009, Young claimed on YouTube that he had cured Kim Tinkham, a woman with breast cancer who had appeared on the Oprah Winfrey show and said she intended to heal herself rather than undergoing medical care. He also posted six testimonial videos to his pH Miracle Living site. However, Tinkham died of her disease about a year later. [10,11]. The videos have been removed, but the images shown here—displayed on the site in November 2013—still imply that Young helped her. Young has been prosecuted three times. In the mid-1990s, he was charged with taking blood samples from two women and using the samples to diagnose illnesses and prescribe products that he sold. Young claimed that he merely looked at blood samples from two women and gave them nutritional advice. However, under a plea bargain, he pleaded guilty to a misdemeanor charge of attempted practice of medicine without a license and was promised that the charge would be dismissed if he stayed out of trouble for 18 months . In 2001, Young was charged with another felony in Utah when a woman suffering from cancer claimed he analyzed her blood and told her to stop chemotherapy and take his "Super Greens" product instead. Young told the woman that he had cured people suffering from AIDS, the affidavit alleged. A month later he was arrested when an undercover agent went to him for a consultation. Young allegedly analyzed her blood and prescribed a liquid diet. A judge ordered Young to stop drawing blood or risk being denied bail. The San Diego Tribune reported that the charges were dropped because the prosecutor didn't think there were enough angry victims to get a conviction. The article also reported that in 2003, Young moved to California because he thought the legal climate there was more tolerant for "dietary researchers" such as himself . I do not have any post high-school educational degrees from any accredited schools. I am not a Microbiologist. I am not a Hematologist. I am not a Medical Doctor. I am not a Naturopathic Doctor. I am not a trained scientist . In June 2017, the judge issued the sentence and expressed hope that Young would not repeat what he did in the future . Without any medical support, Young advised Kali to ignore her doctors, forego conventional medical treatment, and allow Young to "treat" her with injections, diet, and other "remedies." Young and pH Miracle Living falsely represented that he had credentials to practice medicine and treat cancer. Johnson improperly allowed Young and pH Miracle Living to use his name and license as a cover for their unlicensed conduct . In 2016, the Osteopathic Medical Board of California charged Johnson with gross negligence, repeated negligence, and general unprofessional conduct in connection with his treatment of four patients at the pH Miracle Center . In 2017, his license was revoked and he was assessed $20,000 for the cost of the board's enforcement action . I read with special care the part of the book that purports to explain the fundamentals of pH to the non-scientist. This section contains basic errors that suggest to me that Dr. Young is not very knowledgeable about this area; his understanding of basic chemistry seems limited. His definitions of fundamental terms such as "hydrogen ion" are poor, and his explanation of what table salt (NaCl) is and how it dissociates in water is incorrect. He gives the same pH values for blood that comes from arteries and veins; in reality, venous blood is more acidic than arterial blood. The manner in which Dr. Young writes suggests a religious fervor that has nothing to do with science. I saw no footnotes that support his extreme views; in fact, judging by the titles of the journal articles he cites, I saw no citations in either this or another book by him that pertain specifically to the effect of pH on disease. Further, Dr. Young does not describe any of his own experiments that might lead one to think he has a valid scientific basis for his ideas. He makes many extreme statements without any supporting evidence. From what I can see, Dr. Young does not have any interest in actually *testing* whether his ideas are correct. For example, the simple way to test his assertions about the effects of pH on disease would be to give sick people a couple of teaspoons of baking soda per day mixed with water. Baking soda (NaHCO3) is a base and will alkalinize the person's blood at least as well as any of the dietary manipulations Dr. Young suggests. But he appears not to have done this, or even to have studied the medical literature to see if others have . The same observations apply equally to The pH Miracle, which contains so many dubious passages that it would take a book to respond to them all. Young bases his notions about alkaline nutrition on the writings of Antoine Bechamp (1822-1895), and Gunter Enderlein (1872-1968), who held that microorganisms do not have fixed structures but arise from smaller entities that are always present but shift their form and function in response to environmental influences. The Youngs refer to the alleged entities as "microforms" or "microzymas." Page 21 of The pH Miracle states that "all cells evolve from them to begin with" and that "red blood cells . . . can de-evolve and then re-evolve into any cell the body needs." They also state that "morbid changes in microforms" are spurred by body acidity and that "harmful pleomorphic organisms do not, and cannot evolve in healthy (alkaline) surroundings." They further claim to have videotaped transformations from bacteria to yeast, fungus, and mold and back again. Page 32 of the book claims that "acidification and overgrowth of negative microforms in the body are the root cause of every symptom, illness and disease." However, the notion of pleomorphism is unfounded and was abandoned by the scientific community long ago. The book also advises readers to check their pH, "cleanse" for several days, eat a vegetarian diet that emphasizes vegetables, and take various supplements, including colloidal silver. The foods to avoid include all dairy products, meats, eggs, corn, peanuts, and foods that contain sugar (including most fruits). The food recommendations are based on their supposed effect on body acidity and alkalinity and whether or not they contain "toxins." The idea that dietary modification can change the acidity of the body is silly. Homeostatic mechanisms keep the acidity of the blood stream within a narrow range. Certain foods can leave end-products called ash. Alkaline-ash foods include fresh fruit and raw vegetables. Acid-ash foods include all animal products, whole grains, beans, and other seeds. These foods can change the acidity of the urine (but not the body as a whole), but that's irrelevant since your urine is contained in your bladder and does not affect the pH elsewhere in the body . Thus, even if "body pH" were a primary cause of disease, the strategies the Youngs propose would not influence it in the way they claim. About us. pH Miracle Living Web site, accessed Feb 23, 2010 and Feb 4, 2016. Young RO, Young SR. The pH Miracle: Balance Your Diet, Reclaim Your Health. New York: Warner Books, 2008, p 341. Figueroa T. Split verdict for 'pH Miracle' author. San Diego Tribune, Feb 3, 2016. Barrett S. A close look at Robert W. Bradford and his Committee for Freedom of Choice in Medicine. Quackwatch, May 12, 2011. Barrett S. Clayton College of Natural Health: Be wary of the school and its graduates. July 17, 2010. The pH miracle story. pH Miracle Living Web site, accessed Feb 23, 2010. 1 day private retreat with Dr. Young. pH Miracle Living Web site, accessed Feb 23, 2010. Dr. Robert O. and Shelley Young welcome you. pH Miracle Living Web site, accessed Feb 23, 2010. Barrett S. Live blood cell analysis: Another gimmick to sell you something, Quackwatch, Feb 23, 2005.1 day private retreat with Dr. Young. pH Miracle Living Web site, accessed Feb 22, 2010. Van Bockstaele BB. Kim Tinkham, the woman whom Oprah made famous, dead at 53. Digital Journal, Dec 8, 2010. Gorski D. Elizabeth Edwards and Kim Tinkham: A tale of two victims of breast cancer. Respectful Insolence blog, Dec 8, 2010. Herbalist in Alpine pleads guilty to reduced charge. Deseret News (Salt Lake City), Feb 5, 1996. Jenkins L. Naturopathic technique stirring bad blood. San Diego Tribune, April 11, 2005. DA charges two with conspiracy to practice medicine without a license: Defendants using I-V treatments on patients at avocado ranch. San Diego County District Attorney news release, Jan 24, 2014. Figueroa T. pH Miracle author to face new trial. San Diego Union Tribune, March 7, 2016. Deihj P. Sentencing delayed for pH Miracle author. San Diego Union Tribune, May 1, 2017. Young RO. Plea of guilty/no contest - felony. Superior Court of California, County of San Diego., filed April12, 2017. Figueroa T. Best-selling 'pH Miracle' author heads to jail. San Diego Union-Tribune, une 29, 2017. Complaint. Dawn Kali v. Robert O. Young, Miracle Living, and Ben Johnson. San Diego County Superior Court. Dec 13, 2015. Accusation. In the matter of the accusation against Bennie S. Johnson, D.O. Osteopathic Medical Board of California, Filed, July 14, 2016. Decision. In the matter of the accusation against Bennie S. Johnson, D.O. Osteopathic Medical Board of California, Filed, April 5, 2017. Abelow B. Comments from an M.D. who wpH rote a textbook on pH balance. Amazon.com Web site, Jan 26, 2004. Mirkin G. Acid/alkaline theory of disease is nonsense. Quackwatch, Feb 6, 2003. This article was revised on July 3, 2017.